Like many of you, I frequently use the “a little of this, a little of that” approach to cooking. But when writing for this blog, I keep pencil and paper beside my mixing bowl and precisely measure or weigh every ingredient. Oftentimes, however, ingredients really can be eyeballed. So I encourage people to use certain recipes as a framework, noting particular areas where precise measurements may be important. So, as I often do, I have included some choices, below, plus the following details to keep everyone happy: My husband does not particularly care for figs, so I leave a section of the pizza without to keep everyone happy. Sometimes, we toss the prosciutto on the grill for about a minute, or until just crisp, and then crumble over the arugula mixture for an option that adds a little crunch. Lastly, if you like the idea of the syrupy balsamic drizzle overtop but don’t want to invest in an expensive vinegar, consider transforming an inexpensive bottle into a delicious reduction using this easy recipe or a slightly sweeter option included in this recipe. Whichever way it’s served, I love that I get my salad and pizza all in one…and hope you enjoy, too! 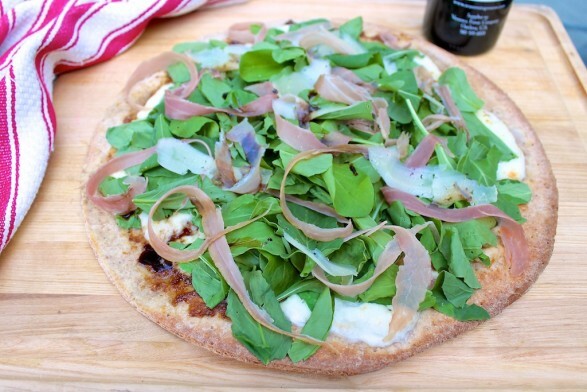 I like the salty-sweet combination in this pizza but use just a thin layer of fig spread to keep its sweetness in balance with the salty prosciutto. Feel free to adjust the amount of any of the toppings based on crust size and personal taste. To vary the flavor, cooked and crumbled bacon may be used instead of the prosciutto. A drizzle of syrupy balsamic is a delicious finishing touch. Spread a thin layer of fig jam over the crust. Top with mozzarella cheese. Bake until the cheese is melted and gooey, 4–5 minutes. Toss arugula and pear, if using, with the olive oil in a large bowl, and season with salt and pepper. Top pizza with the salad followed by the prosciutto. Sprinkle with the Manchego cheese and lightly drizzle with balsamic vinegar. If you find fresh mozzarella to be too watery or bland, you may wish to try smoked mozzarella. It’s a drier cheese with a truly delightful flavor. 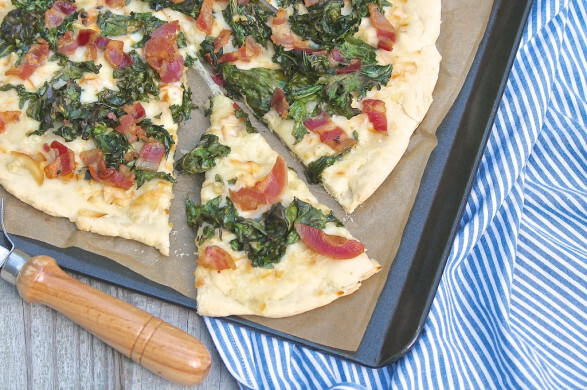 …and the toppings for Smoked Mozzarella, Pancetta and Kale Pizza — a personal favorite! 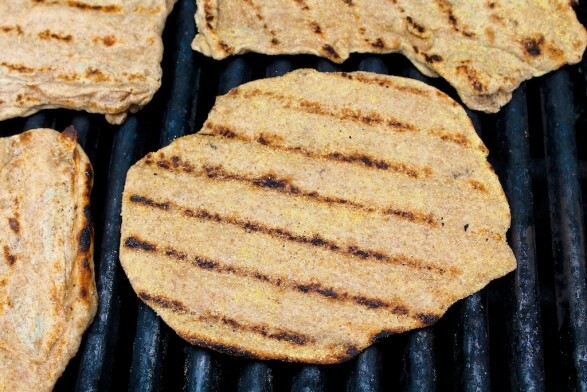 Whole wheat flour may be used in this easy crust recipe that has long been a family favorite. The crusts may even be cooked in advance and frozen. These look so good Ann! 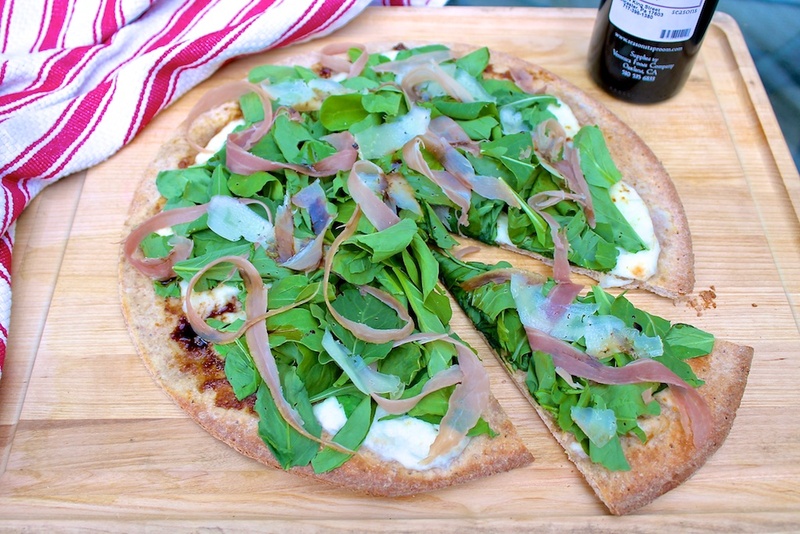 We have a new pizza place in town and they have a wonderful selection of pizzas that are unique, one of which is arugula and prosciutto. I need to check out your recipe for crust..
It’s a tasty combination, Mary Lou, and both the grilled pizza crust and the gluten-free option are longtime favorites here. We had this last night and loved the salad-on-the-pizza concept. So fresh tasting and delicious! I’m so glad you enjoyed, Aimee!